According to a research, working Women spend a major part of their salary on comfort-oriented things like spa treatments. Considering the daily increase in prices of things that are very much possible at home. One can create their own bathroom spa. 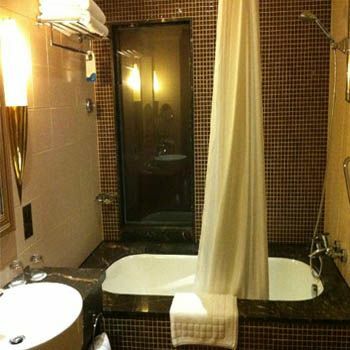 Here we have come up with few bathroom spa ideas that we can do to make our own affordable bathroom spa. Have you ever wondered why hotels keep white towels? That is simply because they add a simple voluptuous effect to a plain washroom. These provide a simple luxury and have a soft feel. The new hand held showerheads with adjustable spray settings are a blessing. No need of a Jacuzzi since this is good enough for a head massage and bathroom spa. Nothing beats bath oils. Scientifically proven lavender oil is soothing and a good moisturizer for skin. Go to these heath care shops like Saeed Ghani etc.Get hold of those oils. The fragrance is long lasting and effect is double to that of any brand. A benefit of using airtight jars is that they keep everything dust free. Clear jars let you keep homemade remedies, oils, creams, scrubs in separate containers. In addition, it adds to the professional bathroom spa look. Use these to pile up your substance. An ideal bathroom spa has to impart a pleasant comfortable glance with serenity. This is incomplete without candles. Scented candles preferably, that you can put up around the bathtub or shelves and sink. These are easily available at any art shop, Sunday market or any retail shop. Towels stacked in baskets made of ken always impart an illusion of lavishness. Not only is that but use of baskets is an organized way of stacking things together. In case, your bathroom spa is small, hang a shelf and put in a few baskets and airtight jars. Separate for cosmetics and everyday use stuff. Pakistani restrooms are quite small to accommodate many accessories’ we women enjoy. Therefore putting up shelves solves our problem by increasing storage. These shelves shall be stacked in style. Use wine bottles (easily available at empress market) or olive bottles with money plant in them. No matter what you do remember, you need to place things properly in your bathroom spa. To add an exorbitant feel to your bathroom spa, Grab comfortable footwear or flip-flops that keep feet clean after a moisturizing treatment. Get one-size fit all. It is justified for spending on lotions in an affordable bathroom spa at home. Get scented or non-scented moisturizers, lotions, and scrubs. Maintaining the bathroom spa is essential. Make sure you keep it clean. Keep a bottle of water mixed with vinegar drops. Spray it around. Here are a few bathroom spa ideas that I have in accumulated to make one’s own economical bathroom spa at home. So that comfort and tranquility comes cheap and you are no longer dependent on parlors when you have your very own bathroom spa. How to Carry Men’s Belts the Right Way!